Quote Reply Topic: New update? It has literally been years, when is 1.21 coming out? There's another thread that has addressed this but there's no timeline. To me it seems to be a lost cause. Thought we had gotten there a few weeks ago but we were mistaken. Oh well. I tried to install ATC pro again last week, resigned to the fact that it’s not going to get fixed and the frustration came back in full force. Having Double Eagle call for a departure and never being able to figure out wth they are expecting me to say (yes I was following the voice commands doc). @brodie4598 I think we all can feel your pain. I know that I had my hopes up when Tom suggested releasing build 21 unfinished but unfortunately this does not look likely at this point. I am not sure why Tom and Dave decided to hold back the releasing the unfinished build 21 even a beta version. There were a bunch of positive feedback supporting the release of the unfinished version. I come from the school of thought where any update that fixes any of the previous bugs and brings enhanced features should be released even though there may be some bugs or even new bugs as long as the release being improvements to the current version. As long as none of the bugs are "game breaking". I am guessing that Dave and Tom have their reasons that the current build is not ready for release. Well, we will have to wait until its finished. 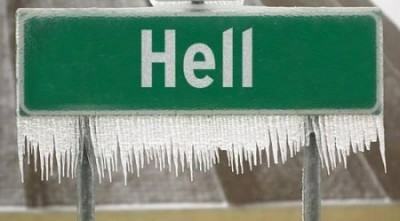 Regarding the sign above: Unfortunately its not the right "Hell" that froze over. Although we have been "to Hell and back" a few times on this forum. Most importantly: I hope that software Tom and his family have a better 2019 and that he has a successful recovery. That is more important than anything on this forum. For a departure release, say "November one two three, heading four zero, maintain eight thousand, released"
Of course you would substitute whatever call sign, heading and altitude needed. "November one two three, cleared from Alexander as filed, maintain eight thousand, departure frequency one two three point niner, squawk six one two four"
Again substituting your call sign and altitude as appropriate. I've had the same problems with the fix names at ABQ, but it seems to be just those three that you mentioned. I always say "dumb emmz" "fat teez" and "dad eee". Sometimes it works but sometimes not. Thanks for that Alan - I actually was thinking I had to direct the command to double eagle in the so that was definitely my problem there - thanks!.